All students participate in a weekly art program with a specialist. A wide variety of media, subject matter, artists, and art styles is explored. Students create with watercolor, tempera, acrylic, watercolor crayon, colored pencil, pencil, marker, soft pastel, oil pastel, torn and cut paper collage, pen and ink, yarn, fabric, clay, and found objects. 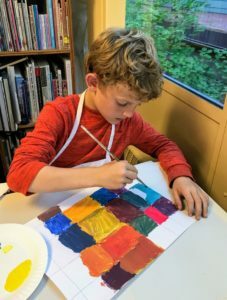 Students explore concepts of shape, size, color relationships, pattern, line, value, repetition, positive and negative space, texture, tints and shades, and expressiveness. Exploration increases in difficulty with each grade and range from simple one-session to complex multi-session projects. Along with visual literacy skills, students develop fine motor, observation, listening, planning, evaluating, and communication skills. 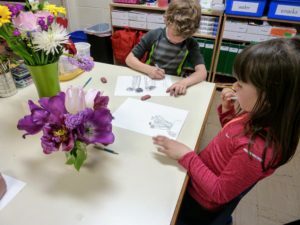 They are encouraged to review criteria, take another look at their work, and make changes or additions, just as they would do in their writing and math work. A selection of art projects are coordinated to make direct links to classroom poetry, writing, science, literature, and art history studies. 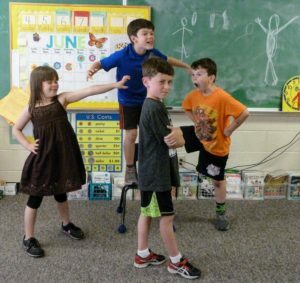 Second and third grade students study art history to gain an understanding of a wide variety of diverse cultures and time periods across the world. Our specific focus begins with preparation for exhibits at SAM, which we attend at least twice a year. Often these exhibits serve as a springboard for further inquiry, piquing our students’ curiosity. Tilden students become comfortable comparing civilizations, and perceptively observing similarities and differences between various cultures, their mythologies, and their art. Our kids enthusiastically discuss ideas and concepts represented by various artists, their times, and their cultures. Learning to use art terms, like composition and balance, helps our students learn to really look at artworks, and to express their perceptions thoughtfully, often passionately.